On Thursday, June 23, 2016- we took a Day Ride to Athens, TN to tour the Mayfield Dairy. It was a beautiful day with mostly blue skies, very warm, and only a slight chance for spotty showers. We left our home in North Knoxville at 9:45am, filled our tanks, and headed down Alcoa Highway (129) to Topside Road. Topside took us through Louisville where we took 322 through Friendsville, and onto 321. 321 took us over Fort Loudoun Dam and into Lenoir City where we took 11 through Loudon and on into Sweetwater. In Sweetwater, we took 68 toward Madisonville. We then took 307, eventually running right into the Mayfield Dairy. As you walk toward the visitor center from the parking lot, you pass by this fantastic mural. The mural is filled with detail. The mural extends all along the backside of the building too. Wow! We arrived at Mayfield’s at 11:45am and the tour started at noon. So we purchased our tickets and looked around the Visitor Center while waiting for the tour to begin. The Visitor Center features lots of history about the Mayfield Dairy and facts about dairy cows. The tour starts with a video about the history of the dairy and the innovative Mayfield family. In 1910, when T.B. Mayfield Jr. purchased 45 Jersey cows and began delivering milk to customers in his hometown of Athens, Tennessee, little did he know that four generations later, his family milk and ice cream business would become one of the nation’s favorite dairy brands. After T.B. Jr. retired, the next generation of the Mayfield family picked up where he left off, and in 1950, under the leadership of owners Thomas B. Mayfield III and C. Scott Mayfield Sr., we build the Southeast’s most modern milk plant. Today, Mayfield is one of the nation’s leading dairies, using advanced technology to bring the best products and innovative packaging to our customers. Mayfield merges with the Dean Food Company in 1990. To see the entire history of the Mayfield Dairy, CLICK HERE and follow along with the timeline. After viewing the video, we began the tour of the factory floor. We weren’t allowed to take photos inside the processing plant. But once inside, we saw how the famous yellow Mayfield milk jugs are made, and how those jugs are filled with milk. We also got to see how school milk cartons are processed and view ice cream being packaged. The Mayfield Dairy not only packages their name brand products, but also some private labels. The inside of the plant is very clean and the workers sure earn their pay! The tour gives you a close up view of the processing of dairy products and how they are packaged. A mom on the way out said to her child, “Now you know how milk is made.” Well that statement is only half correct. The product is shipped in from local dairy farms where the real milk is made by actual cows. But that’s a tour for another day. After the tour, we turned in our tickets for ice cream. YUM! The entire tour from start to finish took about 45 minutes. Then we got our yummy ice cream and spent another 20 minutes porch sitting and enjoying the kids playing. After sitting in the Visitor Center courtyard, we got back on our bikes and rode into downtown Athens to look around. We parked right in front of the courthouse. The stately McMinn County Courthouse. The flags, in honor of Independence Day, look fabulous! We walked around the courthouse block to see much of downtown Athens. There’s Jeff enjoying the view. Another view of downtown Athens. We always love seeing such beautiful historic buildings. After gawking awhile, we headed out on highway 11 and stopped at Michael’s- a family restaurant located right on the outskirts of town. We arrived at Michael’s just after 2pm. Michael’s is right off highway 11. Pamo gets her ice tea and that makes her very happy. YUM! Should’ve shown the blackened chicken inside the bun… it was delicious. Jeff got the club sandwich… it was delicious also. YUM! Next time you are in Athens, check out Michael’s. The food is great and the staff makes it a really nice dining experience. After lunch, we rode north on 11 through Niota and into Sweetwater. In Sweetwater, we took 322 over to 72, then turned onto 444 through Tellico Village. … to check out the water. We got back on our bikes, then 10 minutes later, decided to check out the boat dock and Tellico Dam. This boat dock was newly built in 2010. Nice! We decide to walk for a closer view of the dam. View back toward the dock and Watts Bar Lake. After enjoying our visit, we got back on the bikes and rode back into Lenoir City. We made a fuel and water stop in Lenoir City. After our hydration break, we took 11 back into Farragut and then back into Knoxville. We stopped in downtown Knoxville for a few photos. There’s the now ‘for sale’ TVA towers. Any buyers out there? Always love seeing the contemporary art in downtown. Downtown Knoxville has a thriving art district. After snapping a few photos downtown, and finishing off the rest of our water, we headed the short distance home. We got back home at 5:15pm and our total ride was 157 miles. Our fur kids were very happy to see us. Can you see Dave? Hint: look under the bench. 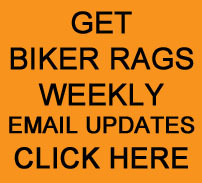 This entry was posted in Day Ride and tagged Biker Rags, Day Ride, Mayfield Dairy tour. Bookmark the permalink.